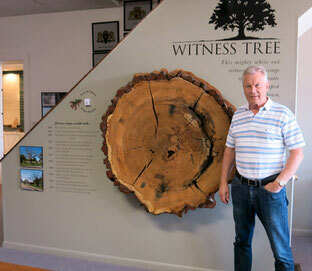 Keith Boonstra shows the newly mounted Witness Tree at the Dekker Huis and Zeeland Historical Museum. The tree was 174 years old before it died and was cut down for firewood. Boonstra saved a slice of the tree and preserved it for the museum exhibit. A big slice of history that weighs approximately 200 pounds and contains an untold amount of memories was recently donated to the Zeeland Historical Society Dekker Huis Museum to assist in chronicling past events. The new addition is a four-foot-wide section from a massive while oak tree that predates the founding of Zeeland. A special bracket was constructed to hold the top and bottom in place. The 174-year-old tree was located at 525 E. Washington Ave., just east of the John A. Vanden Bosch feed mill's office. The tree had died and was being cut down for firewood in 2014 when a neighboring business owner, Keith Boonstra of Zeeland Architectural Components/Zeeland Wood Turning, inquired about obtaining a section from the tree's trunk. Boonstra's employees used mechanical sanders to reveal the tree slice's many rings. Small screws and adhesives attach the bark to the stump. Numerous coats of lacquer were also applied to seal and protect this unique piece of history. "It will continue to dry out and split. But that is part of the character," noted Boonstra. "Since we have finished the project, the aging/patina has been phenomenal and will continue over time." Museum officials were originally hoping to place pins in the tree's rings to indicate certain points of the community's history. But that has been replaced by a tape-recorded message and some text located alongside the slice. "Our consultant was concerned about kids pulling out the pins, possibly getting hurt, and the damage that might occur with the surface," explained Museum Manager Suzy Frederick. The tree slice dates back to 1840 when Washington Avenue was just as old Indian trail. Settlers had originally called the road Chicago Drive because it linked Grand Rapids with Chicago. Over the years the tree would witness the community's history unfolding, first as other trees were cut down to create a roadway in 1849. In 1865, only 14 years after some of the settlers arrived in Michigan from the Netherlands, the fledgling community sent some of their young men off to battle in the Civil War. Another close shave occurred in 1901 when the oak tree avoided the ax during the installation of the Interurban/railroad tracks. The electric train became a popular transportation option for people traveling between Grand Rapids and Holland. Over the years numerous people stopped by and enjoyed an outdoor meal at the tree-shaded picnic table provided by Ottawa County. "It wasn't uncommon years ago for the county or cities to put picnic tables alongside the road for people to enjoy their lunch,"' said Boonstra. "'Back then, there weren't as many restaurants, so it wasn't uncommon for people to pack their lunch when they traveled." It was around 2005 when Boonstra and the property owner noticed the tree's leaves were not returning each spring, and that its days were numbered. The mighty oak finally fell nine years later, but has now branched out into history preservation.